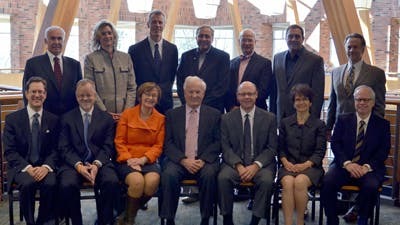 September 30, 2014 | 2 p.m.
Bethel Foundation’s Board of Governors is dedicated to Bethel’s mission. The Bethel University Foundation and endowment might be the best-kept secrets on campus. Since 1971, the Foundation’s two objectives—to benefit donors by helping them meet their financial goals and to support the university as a whole with enhanced financial strength and stability—have sustained Bethel’s mission to prepare leaders who serve with excellence in every aspect of life. The Foundation helps donors plan and steward their charitable giving based on their individual needs. And donors can use the services of the Foundation at no cost. Angella Hjelle, executive director of the Foundation, describes its services as similar to those available through a trust department at a bank, but with no fees. The Foundation’s services include trust management, non-cash gift management, and charitable gifts. Hjelle says these are administered with the best possible stewardship and the utmost professionalism so that gifts such as real estate, securities, or life insurance are managed with maximum benefit for the donor and for Bethel. “We do this by staying current with laws that affect donors’ situations and by helping them manage their donations responsibly and professionally in ways that meet their personal wishes,” she explains. The Foundation’s second objective is accomplished through the management of the endowment, which, according to Hjelle, is similar to a household’s or individual’s savings account. “The endowment is the underpinning of an institution’s financial stability, like a savings account for an individual,” she points out. Donors set up endowments, which are restricted gifts that must be used in a way that matches the donor’s specific intent. Like many investment portfolios, the Foundation’s portfolios are fully diversified and invested in the financial markets and experience all that comes with being part of those markets. It has rallied back from the challenging economic climate of the mid-2000s, nearly doubling in size since 2011. As of July 31, assets under management were $129 million, up from $66 million three years ago. “The main reason for this increase is that two years ago the foundation assumed management of the defined benefit plan assets for the university, which brought an additional $50 million to our assets under management,” Hjelle explains. Local business leader Donald E. Benson, executive vice president and board member of Marquette Financial Companies and Services and longtime chair of the Foundation’s Board of Governors, explains the increase in financial gains. “Thanks to our well-managed resources and investing disciplines, our portfolios have regularly outperformed their benchmarks in recent years,” he says. Pat Mazorol, senior vice president of university relations, adds that the enhanced performance and strong financial position are thanks to “an effective and diversified Board of Governors,” referring to the volunteers who help oversee the Foundation and the endowment. Operating as an independent nonprofit, the Foundation is directed by an experienced 20-volunteer member Board of Governors and professional and experienced staff who work hard to ensure the best possible investment returns for the university and its supporters. Benson has been with the Foundation almost from the beginning. He brought a professional perspective to financial matters when he became active with the Foundation soon after its incorporation in 1971, and has served as chair of the Board of Governors for many years since then. He credits others for creating a viable Foundation, including Gunnar Kronholm and Bethel President Emeritus George Brushaber—as well as the innovation of Harvey DeVries and Warren Eastlund—who each played a role in the creation of the charitable remainder unitrust concept. The Bethel Foundation pioneered the use of the charitable remainder unitrust, which is used universally by foundations, back in the 1960s. 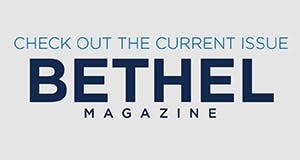 The Foundation’s success originated in part with the launching of the now very successful academic business program at Bethel College in the 1970s and 80s, which was initially sponsored by Benson and the late Kronholm. Benson believes the Foundation and its endowment are well poised for many years to come. “We’re committed to building the Foundation’s endowment as a strategic financial resource for the future,” he says. Learn more about the Bethel Foundation and endowment.